For years this coat of arms hung above the magistrate’s desk at the Harbour Grace Courthouse, before the building closed in 2015. Much of what we know of its history comes from W.W. French, a former jailer. According to French, James Clancy painted the coat of arms in 1850. A writer, painter and musician, Clancy was said to have escaped some trouble in Ireland. What “trouble” is unknown, for the reticent Clancy “brooked no question as to his condition.” However, one can speculate about his well educated origins and “gentlemanly bearing.” For years he was keeper of Rogerson’s Farm, on the south side of Lady Lake. Clancy out his later years in relative obscurity. On January 20, 1865, he was found dead in the eastern house of the range, commonly known as the Great Eastern, at the southeast corner of Harvey St and Kerry Lane, Harbour Grace. The coat of arms is the standard iconography of the United Kingdom and its monarchy. The French script around the Royal Coat of Arms is the motto of the chivalric Order of the Garter: “Honor soit qui mal y pense”–“May he be shamed who thinks badly of it.” To the left is the English lion; to the right, the Scottish unicorn. The coat of arms is quartered: in the first and fourth quarters are the three guardian lions of England; in the second, the rampant lion of Scotland; and in the third, a celtic harp for Ireland. James Clancy’s Royal Coat of Arms (1850) above the magistrate’s desk, ca. 1910. 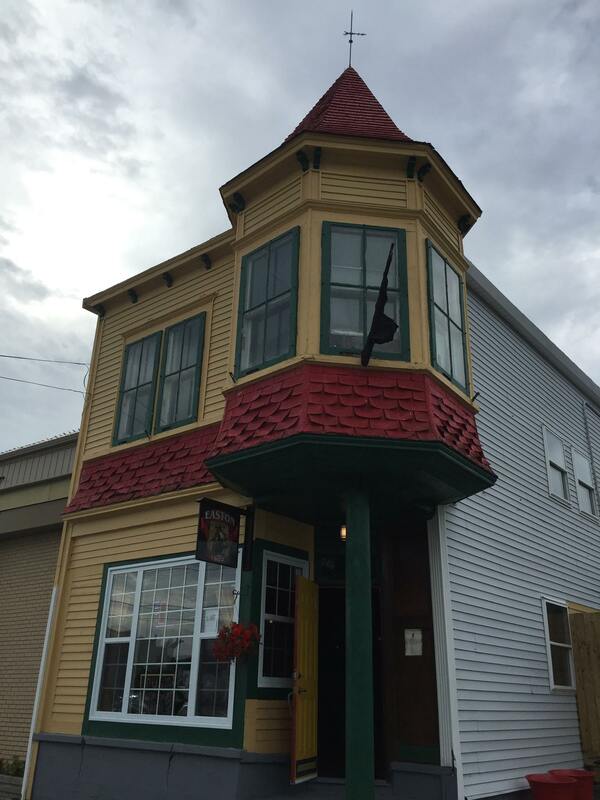 William Carson, a Harbour Grace contractor, constructed this building on Bannerman St around the turn of the last century, at a cost of $8,000. First slated to be built on Water St, this new public building housed the offices of various civic organizations and government departments. The fire brigade used the right tower to hang and dry hoses. The structure was practically torn down in 1943, and the remaining materials were recycled to construct the present-day Firemen’s Social Building on the same foundation. Do you have to any information on the old Fire Hall & Public Building on Bannerman St, Harbour Grace? Contact us! On April 12, 1858, a fire broke out in Harbour Grace, often considered the second “great fire” in the town. 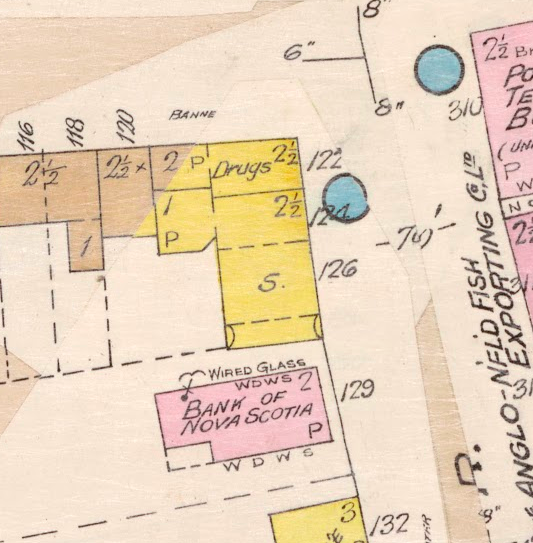 The principal downtown trading quarter, between LeMarchant St and Victoria St, was reduced to ashes, and some 50 families were deprived of their trade or business, most of them being shopkeepers, tradesmen, or planters. Several persons had some small portion of their stock insured, but many were not able to pay their debts. The fire started at Toussaint’s Hotel about 9 p.m. The fire burned both sides of the street, ending at Punton & Munn’s at midnight. Only three houses survived on the north side of the street: Pike’s, Lynch’s and Jillard’s. One of the three that survived was occupied by Captain Neddy Pike. The house belonged to Sandy Campbell, one time foreman of the firm Danson. Situated at the east corner of Victoria St and Water St, the property outlived the three “great fires” fires of 1832, 1858 and 1944. Later, in the second half of the twentieth century, the old building was taken down to build Sinyard’s Drug Store. In the early twentieth century, the house was known as Dinn Shea’s. Sandy Campbell’s house (left), which survived the three “great fires” of Harbour Grace. The house was later torn down to build Sinyard’s Pharmacy. South Side of Water Street: Dr. [William] Allan; N. & J. Jillard; Punton & Munn; John Fisher; Captain Munn; Capt. Taylor; James Hippesley; Capt. Drysdale; Rachael Green; Doyle & Hunt; Ridley & Sons; Rutherford Brothers; Capt. John Stevenson; Charles Walker. North Side of Water Street: Thomas Wolfrey; Richard Lahey; Patrick French; Robert Walsh; James Drysdale ; Mrs. Dixon; Garrett Condon; Matthias O’Neill; Mrs. Gushue; Mrs. Maddox ; Thomas Walsh; Patrick Strapp; John Mullaly; Mrs. Mulloy; John Byrne; T.C. Toussaint; The Misses Prendergast; William Burke; Pierce Maher; Catherine Degan; William Fitzgerald; Mrs. Cooney; Peter Murphy; Mr. Dillon; Mrs. Ronan; Mrs. Finn. Rear of Water Street: Michael Power; Thomas Candler; William Grubert; Mrs. Brien; Patrick Scanlan ; Mr. Green; Thomas Griffin; Peter Murphy; Mrs. Lahey. The next day, April 13, at the Temperance Hall, a group assembled to petition the House of Asssembly to aid the sufferers. 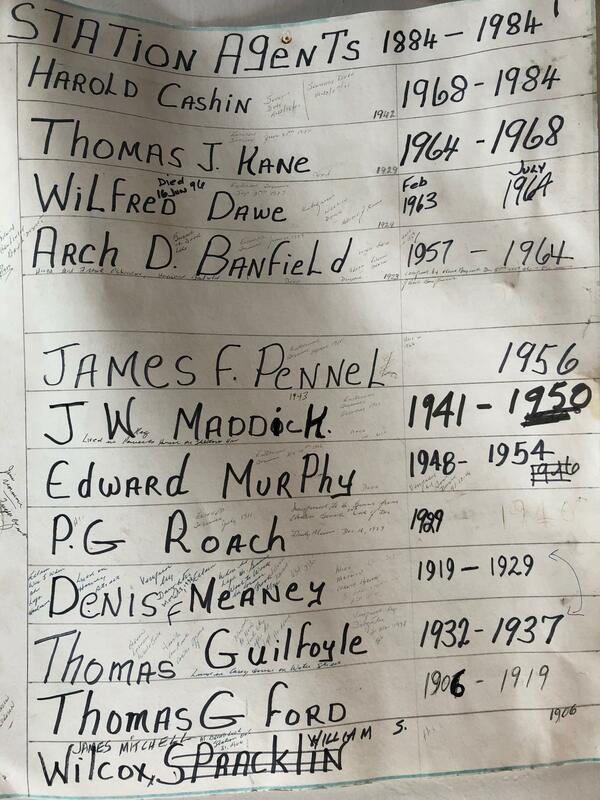 Names on the roll included William H. Ridley, Henry T. Moores, W. Donnelly, Thomas Higgins, John Richards, Patrick Devereux [sic], James Hippesley [sic], William Grubert, W. Howlett, Joseph Godden, and J.L. Pendergast, the local MHA. In the mid-nineteenth century, Ferryland native Michael Condon Kearney was in high demand. A genius, self-taught shipbuilder, Kearney had a shipbuilding yard on the south side of St. John’s, where he built many vessels. In 1848 Kearney came to Harbour Grace and built the Arabella Tarbet for foreign service. John Munn subsequently had Kearney build another ship, the Naomi, after his wife Naomi Munden. According to W.A. Munn, the Rothesay was “often challenged…but always won.” One such race took place when the Rothesay met Holmwood’s Tasso at Demerara. The Tasso was considered the fastest sailing vessel out of St. John’s. They left Demerara side by side, but soon lost sight of each other; they only caught sight of one another again at Cape Race. The Rothesay was the first to pass Cape Spear on her way to Harbour Grace with flags flying. During Michael Kearney’s stay at Harbour Grace, he was superintendent of building four different vessels at one time. John Rorke had the largest sealer: a 260-ton behemoth built at Carbonear, which he christened Thomas Ridley after his old friend and relative. Ridley & Sons had the Brothers built at the Beach premises. William Donnelly had the brig Saint Fillian built at Spaniard’s Bay. Capt. Azariah Munden had the Four Brothers constructed at Brigus. During this period, over 100 men found constant employment at the Beach premises. Also, Michael Kearney famously built the wooden ‘beacon light’ in Harbour Grace in 1850. Colston’s Cove (or Bradbury’s Cove) in winter, ca. 1960. The Endeavor lands salt at Colston’s Cove (artist’s rendition), October 7, 1612. After Guy, Bristol merchants established a plantation near this same site, under the auspices of Robert Hayman, author of Quodlibets, the first book of English creative writing written in the New World. We now come to where Isaac Bradbury had his fishing stage, right in front of where we now find the Methodist Church stands at the present time. This property was purchased from the Garland family. The Bradbury family had aristocratic connections in the Old Country, and have always held a high name in Harbour Grace. Bradbury’s Cove is still known by that name, although the fishing stages have vanished long ago. Tradition says that this was originally Colston’s Cove, and this name dates back to 1610 when William Colston was right hand man with our first Governor John Guy…and where the salt was landed in 1612. 1 Mar. 1832: The striking sealers of Harbour Grace and Carbonear post their final notice: the merchants have until March 3 to settle their agreements. More info: Perseverance: The Sealers’ Strike in Harbour Grace & Carbonear, 1832. 3 Mar. 1832: Between 500-600 sealers gathered at William Innott’s pier, on Harbour Grace wharf. The magistrates, with police and specials in tow, could do little to quell the gathering. He reported to the governor that “the noise, uproar, and numbers made any attempt to stop them futile.” The sealers then paraded through the streets, halting in front of each merchant house to call out their agreement. Each merchant agreed to the terms in turn; each agreement was saluted with a cheer and the men moved on. More info: Perseverance: The Sealers’ Strike in Harbour Grace & Carbonear (1832). 4 Mar. 1878: Ernest Sheppard, ferryman and cooper, born in Harbour Grace to John Coryer Sheppard and Janet (Courage) Sheppard. He would later serve with distinction in the South African War as part of Lord Strathcona’s Horse and the South African Constabulary, a British paramilitary. More info: Artifact Profile No. 2: Portrait & Military Discharge Papers of Ernest Sheppard (1878-1955). 4 Mar. 1955: Ernest Sheppard dies at St. Clare’s Mercy Hospital, St. John’s. He is buried at St. Paul’s Anglican Cemetery, Harbour Grace, with his wife Anne Beatrice (Smith) Sheppard. More info: Artifact Profile No. 2: Portrait & Military Discharge Papers of Ernest Sheppard (1878-1955). 6 Mar. 1852: The St. John’s-Carbonear telegraph line goes into service. To celebrate the inauguration of the line, Frederick Gisborne gives a public lecture to the Mechanics’ Institute at the Old Factory, St. John’s. Many public officials and dignitaries attend the discussion. The telegraph office is situated at the Commercial Building, Duckworth St, and connects to the system linking Harbour Grace and Brigus. 14 Mar. 1832: The sealers and merchants of Harbour Grace and Carbonear establish peace, their (dis)agreements settled. The fleet leaves for the ice. More info: Perseverance: The Sealers’ Strike in Harbour Grace & Carbonear, 1832. 20 Mar. 1879: Thomas Ridley dies in Upper Tooting, Surrey, England, aged 80. More info: Facebook. 22 Mar. 1904: Thomas Harrison Ridley dies in London, England. 23 Mar. 1823: Enrico Carfagnini born in Aversa, Italy, to Liborio Carfagnini and Ascenza Ciancarelli. 26 Mar. 1940: Sir Richard A. Squires dies in St. John’s. Born at Harbour Grace in 1880, the only child of Alexander Squires and Sidney Jane Anderson, Squires became two-time Prime Minister of Newfoundland (1919-23; 1928-1932) and possibly its most controversial political figure. More info: Facebook. 29 Mar. 1968: Old Riverhead Post Office shuts its doors; new Post Office opens. More info: Profile: Old Riverhead Post Office, 1916-1968. 30 Mar. 1853: People of Harbour Grace send a petition to the Legislature to construct a sewer on Water Street. 31 Mar. 1984: Harbour Grace Railway Station officially closes. P.J. Hickey, then mailman on the train, approached Archibald W. Piccott, Minister of Marine and Fisheries and MHA for the Harbour Grace district, and told him of the hardship of the people who had to stand outside a dwelling and receive the mail through an open window. The House of Assembly was not open at the time; so Piccott asked P.J. Hickey if he could guarantee $1,000 for construction, until the legislature reopened. J. Mackey supplied the amount and the Post Office was built. Mike Mackey served as foreman, and lumber came from Gosse’s Mill, Spaniard’s Bay. The Post Office was constructed near the bottom of Station Lane (today, the Hard Path), which the postmaster/postmistress would walk up each day to meet the train, pick up the incoming mail and drop off outgoing mail. On May 18, 1916, opening day, Mary Coady became Riverhead’s first postmistress. After her death in 1937, Henry Coady was postmaster for eight months. Afterwards, Justin McCarthy worked there from October 1937 to August 14, 1941; Nelly (Barron) Ryan from August 15, 1941, to November 30, 1946; Marie Kelly from December 1, 1946, to 1951; and Margaret Cleary from 1951 until 1968, when the building closed. James R. Tucker, MHA for Trinity-Conception, officially opened the new Riverhead Post Office on March 29, 1968, at 12:30 p.m. Sister Sylvia recited the Lord’s Prayer and Edward Russell–at 85, the oldest man in the community–posted the first letter. Johnny Shanahan, of Riverhead, and Betty Ann Peddle, of Tilton, cut the ribbon. Mail was delivered from the new location on March 30, 1968, by Margaret Cleary. The Riverhead Post Office was eventually closed in the 2000s and replaced by outdoor mailboxes. Do you have any memories or pictures of the old post offices at Riverhead? Contact us! 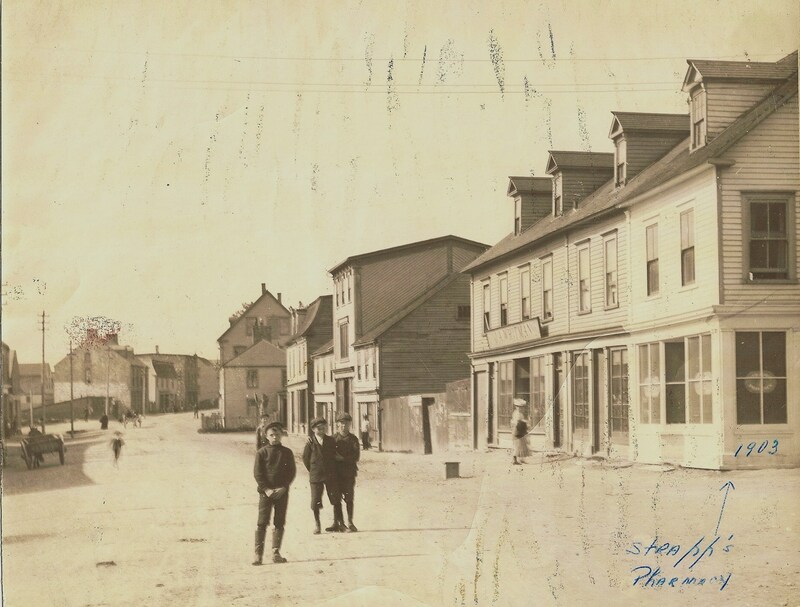 Strapp’s Pharmacy (left) opened on August 31, 1900, on the corner of Bannerman St and Water St.
Dr. Walter A. Strapp, a local physician, opened Strapp’s Pharmacy on August 31, 1900. The business was located at the corner of Bannerman St and Water St. Edward D. Freeman, 14 years old, went to work there for Strapp in 1900. Six years later, in 1906, Strapp appointed Freeman pharmacy manager. 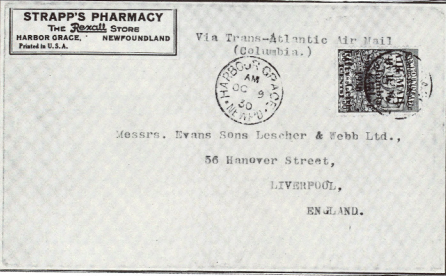 Freeman operated the drugstore for several decades thereafter, developing the business into an important point of interest and information on Water St. As Patrick Collins writes in Dr. Charles Cron (2010), his biography of the well known local doctor, Strapp was “esteemed as a wonderful physician.” He began practicing with Cron when the latter returned to Harbour Grace from McGill. Though Strapp was doing well in his later years, he fell over a steep set of stairs and was never the same after. He died on April 2, 1918. Fire destroys the Government Building, Water St, 1944. Strapp’s Pharmacy pictured right. At some point before 1932, a new building was constructed (or renovated) on the site of Strapp’s original pharmacy. This new building featured a turret overhanging the entrance – a prominent landmark on Water St to this day. Across the street stood the former Government Building, the brick-and-stone structure which housed the Post Office and a telegraph office. Tragically, a great fire on August 17, 1944, gutted this grand edifice, and its shell remained on Water St for over twenty years before its final demolition. Fortunately, Strapp’s Pharmacy survived the 1944 fire and continued normal operations. A prominent man in town, Freeman was deeply involved in community life. Notably, he served as chairman of the Harbour Grace Fire Sufferers’ Relief Committee, which raised $61,000 to help those who had homes and possessions. He was also treasurer of the Knights of Columbus, president of the Tennis Club, a member of the Harbour Grace Regatta Committee, and a former town councillor. The September 7, 1962, edition of the Daily News, a St. John’s newspaper, noted that Freeman, “although 76 years old[,]…is at his desk every day and always has time to chat with friends and visitors.” Rex Sinyard apprenticed under Freeman, later opening a pharmacy shop at the bottom of Victoria St. In the 1970s, Dr. Joseph Dunn operated Strapp’s. Edward D. Freeman and his daughter Kathleen, graduate pharmacist, 1962. The Strapp’s Pharmacy building still stands on Water St, Harbour Grace. Today, it’s Easton 1602 Pub. 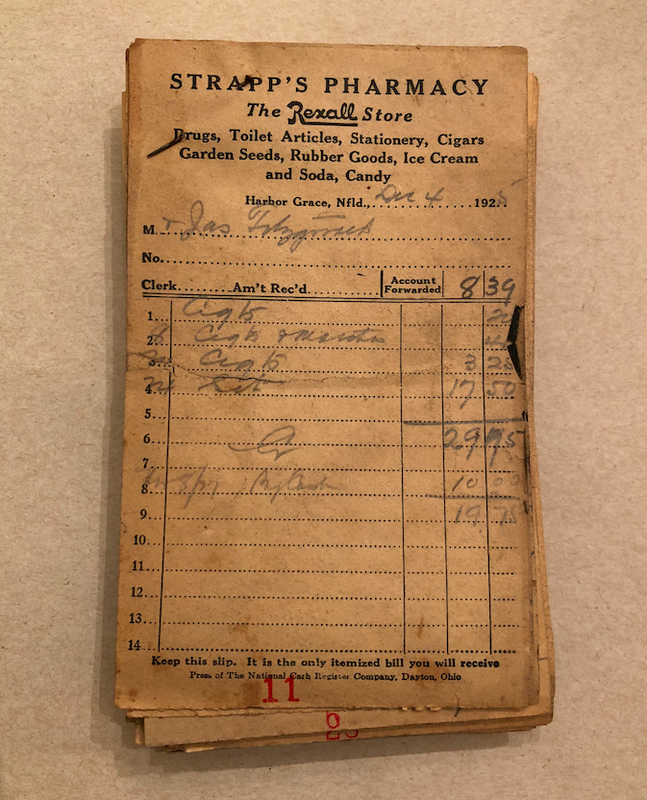 Our collection of receipts from Strapp’s Pharmacy are dated 1924, 1925, 1934 and 1935. There are 106 receipts in the collection, 103 signed for “Mr. Oscar Howell” (1934-35) and 3 signed for “Mr. Jos. [Joseph] Fitzgerald” (1924-25). As the company header indicates, by at least 1925 Strapp’s Pharmacy operated as a Rexall Store, a chain of pharmacies still in existence. 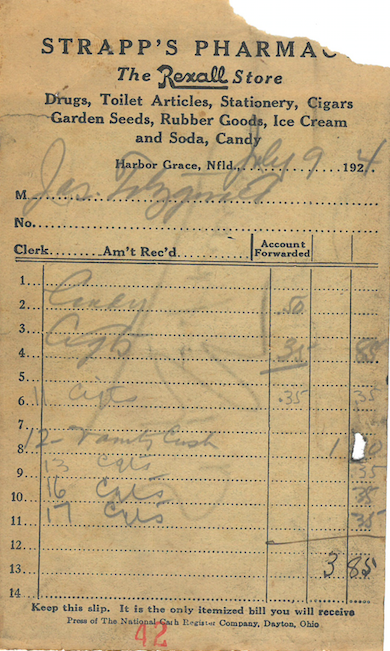 As a Rexall affiliate, the pharmacy sold “drugs, toilet articles, stationery, cigars, garden seeds, rubber goods, ice cream and soda, [and] candy.” The above pictured receipt, numbered 4, is dated October 21, 1935. 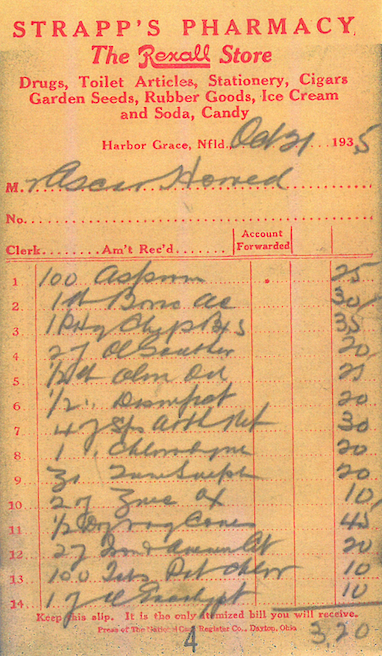 Though the handwriting is difficult to read, 100 aspirin, the first purchased item, cost $0.25 at Strapp’s in 1935. The customer’s total is $3.20. 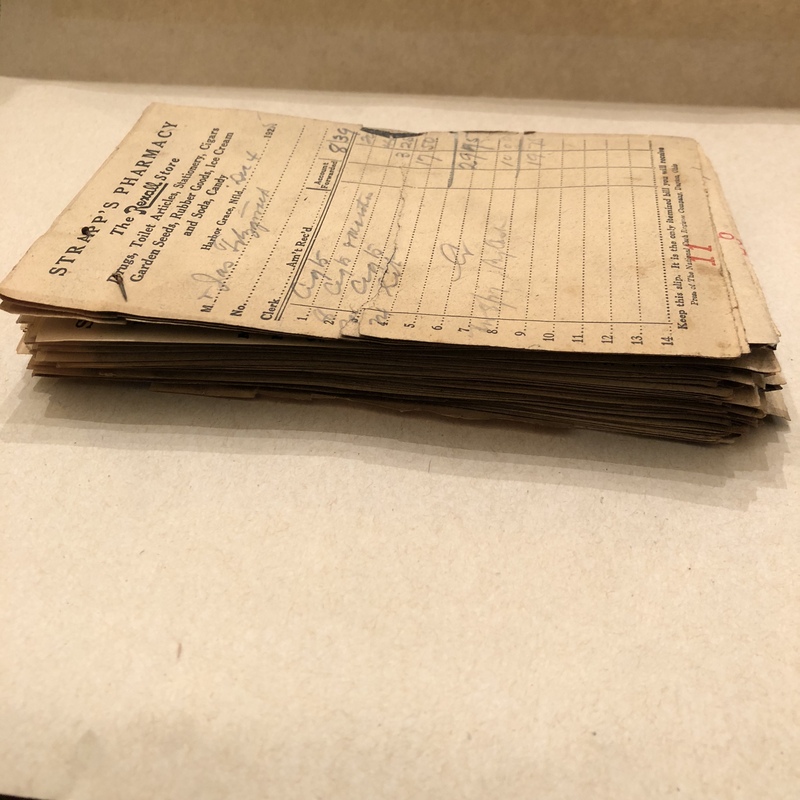 These receipts were recently found stored at the Harbour Grace Railway Station (donor unknown). Look for them to be displayed in The Landing this summer, alongside our equipment from Dr. Goodwin’s dentistry. One of the later owners of Strapp’s store, Kevin Williams, converted the space into Cuff’s Pub. Williams also has a number of receipts from pharmacy. In conversations, he noted Oscar Howell as a frequent purchaser in his collection of receipts. As well, he possesses the McGill University degree of Dr. Gerald Anthony Strapp (pictured below), Walter Strapp’s son. Williams found the degree inside the old pharmacy. Other items and advertisements from Strapp’s can be seen below. 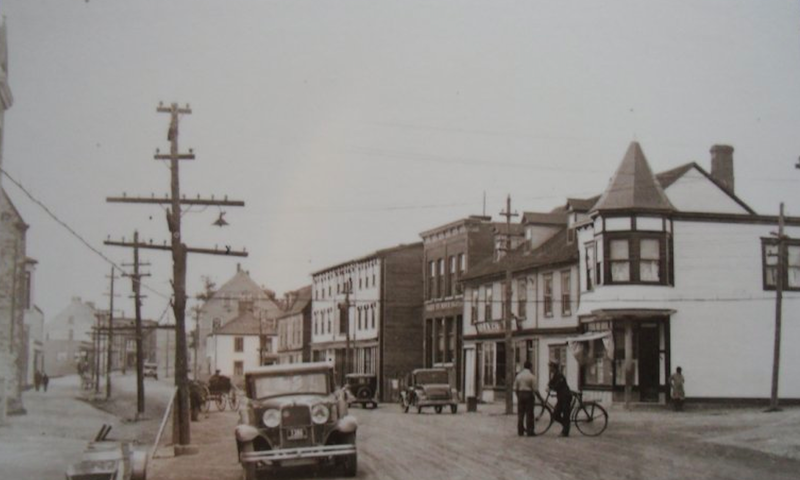 More importantly, do you have any memories or further information regarding Strapp’s Pharmacy at the corner of Bannerman St and Water St, Harbour Grace? Contact us! Water St, looking west, May 7, 1932. Strapp’s Pharmacy pictured right. Strapp’s Pharmacy noted on Chas. E. Goad’s insurance map, 1911. Collins, Patrick J. Dr. Charles Cron: A Doctor for All Time, A Man Who Cured Our Hearts. Bowmark, 2010. Print. Connelly, R.J. “Strapp’s Pharmacy.” Story of Harbour Grace, 1980. Print. “Harbour Grace Steeped in History.” Daily News, St. John’s, September 7, 1962. Print. 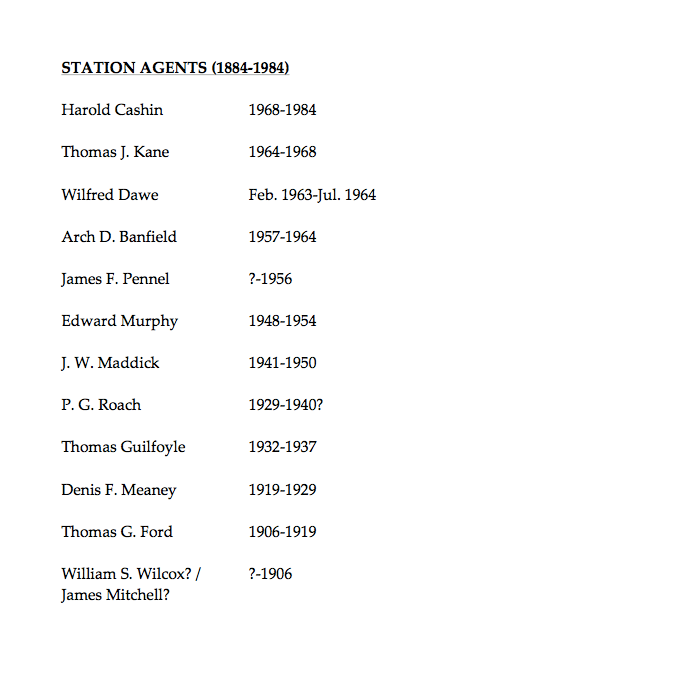 Do you have any information on the station agents in Harbour Grace from 1884-1984? If so, contact us! View the working document here. Pictured: Slide-hauling wood, Harbour Grace, ca. 1910. (Lady Lake or Bannerman Lake?) These slides were often called “catamarans,” which the Newfoundland English Dictionary defines as “a sled with stout wooden runners curved up in front and with a vertical stick, or ‘horn,’ at each corner, hauled in the winter by dogs, horse or man, used esp for carting wood and other heavy loads, but also for pleasure.” Also, the horse in this picture is the famous Newfoundland pony breed. Photo courtesy Conception Bay Museum archives.